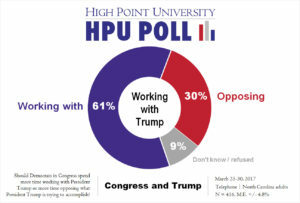 HIGH POINT, N.C., April 5, 2017 – The new High Point University Poll finds that despite the highly polarized political environment, majorities of North Carolinians prefer elected representatives to seek common ground on issues like health care and the North Carolina state budget. The poll found that 61 percent of North Carolinians say that Democrats in Congress should spend more time working with President Donald Trump, while 30 percent say more time should be spent opposing what Trump is trying to accomplish. This desire for compromise extends to the issue of health care where 50 percent of North Carolina residents now say they approve of the 2010 health care reform law Congress passed and former President Barack Obama signed into law, compared to the 42 percent who approved of the law in a February 2015 HPU Poll. 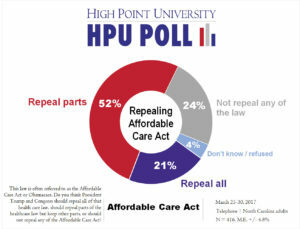 A majority (52 percent) of North Carolinians favor repealing some parts of the Affordable Care Act and keeping other parts, while 21 percent support repealing all of the health care law and 24 percent support not repealing any of the law. The preference for compromise includes state budget priorities in Raleigh too. A majority of North Carolina residents (60 percent) say that they would like to see a budget that includes a balanced amount of both the governor’s and General Assembly’s priorities, compared to 13 percent who say they would like to see more of Gov. Roy Cooper’s priorities reflected and 9 percent who say they prefer more of the General Assembly’s priorities in the budget. Most citizens, however, do not know very much about the state budget debate. Only 8 percent of the poll’s respondents say they have heard a lot about Cooper’s budget proposal, and 62 percent say they have not heard much at all about it. Meanwhile, a total of 40 percent say they approve of the proposal, compared to a total of 19 percent who say they disapprove. Forty-two do not offer an opinion one way or another. Should Democrats in Congress spend more time working with President Trump or more time opposing what President Trump is trying to accomplish? In 2010, Congress passed and President Obama signed into law a health reform bill. Based on what you know about this law, would you say you approve or disapprove of the law? This law is often referred to as the Affordable Care Act or Obamacare. Do you think President Trump and Congress should repeal all of that health care law, should repeal parts of the healthcare law but keep other parts, or should not repeal any of the Affordable Care Act? As you may know, Governor Cooper recently introduced a budget that reflected his policy priorities. How much would you say you have heard about his budget proposal? Overall, and based on what you know about Governor Cooper’s budget proposal, how much would you say you approve or disapprove of his priorities? Would you say you strongly approve, somewhat approve, somewhat disapprove, or strongly disapprove? The General Assembly will pass a version of the budget that Governor Cooper must accept or reject. Do you think that budget should include many more of the Governor’s priorities, many more of the General Assembly’s priorities, or a balanced amount from both? 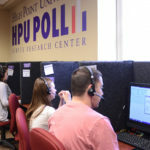 The most recent HPU Poll was fielded by live interviewers at the High Point University Survey Research Center calling on March 25–30, 2017. The responses from a sample of all North Carolina counties came from 416 adults with landline or cellular telephones. The survey has an estimated margin of sampling error of approximately 4.8 percentage points for all adult respondents. The data is weighted toward population estimates for cellular and landline telephone use, age, gender, and race. In addition to sampling error, factors such as question wording and other methodological choices in conducting survey research can introduce additional error into the findings of opinion polls. 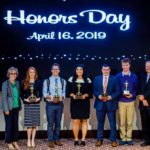 Details from this survey are available at http://www.highpoint.edu/src/files/2017/04/52memoA.pdf.